I got a recent question about what would be the best pull-up rig for someone who was going to be using it on a cement floor where they couldn’t anchor the rig. This person wanted a rig that would not move when doing butterfly pull-ups and would have a high enough anchor point for rings. He and his wife would both be using the rig. My answer was an S3 with a Dirty South Bar cross member and side storage or base storage. The height of the S3 would allow him to hang rings, while also having a lower pull-up bar that both he and his wife could use. loading his plates on the base storage, would keep the rig stable when kipping or doing butterfly pull-ups without having to anchor the rig to the ground. The video above shows how stable the S3 can be, even when not anchored to the ground. We offer several U.S.A Made Glute Ham Developers made by Rogue as well as Sorinex and Legend. Legend Fitness makes all of their Glute Ham Developers to order, which allows you to customize the color of the frame and pads. They offer 3 different levels. The Legend Econ GHD ships unassembled to save on shipping cost, but is still rock solid. It comes standard with a split pad. The Legend Standard GHD is made from 11 gauge 3×3″ tubing and is a fully welded design, for maximum stability. It adds band pegs and also comes standard with a split pad. The Legend Pro Series GHD, incorporates larger, 32″ wide, foot pads and a footplate of the same width. It is even heavier for more stability. It has 8 linear adjustments on 4 linear bearings. It has 2 band pegs per side to further increase functionality. Sorinex is one of the most respected and most experienced GHD manufacturers in the market and they now offer a GHD specifically aimed at the CrossFit market. The Sorinex GHD-M2 is the new version of the FN-GHD that was used at the 2010 CrossFit Games. It is an incredibly stable GHD that ships unassembled to save on shipping cost. It incorporates a unique footplate adjustment mechanism. While it does not have the ability to move the foot pads up or down, the shorter upright makes it easier to move the foot pads forward and backward. The GH-1 Rogue Abram GHD is the product of years of research and planning. It is rock solid piece of machinery made from 2×3 steel tubing. It ships unassembled to save on shipping cost, but is as solid as any welded design out there. The frame is made from 2×3″ steel, making it inherently stable and it has 2 set screws on the adjustment for the upright, set at 90-degree angles to completely eliminate motion when using the GHD. It has wheels for portability as well as holes for our band pegs. 1. Rogue Flat Utility Bench: The base is a single welded piece for maximum stability. 2. Rogue Bolt Together Utility Bench: ships disassembled to save on shipping cost. However, this is not the typical bench that you will find at the sporting goods store, that will become wobbly over time. It is rock solid once assembled. The bolt together construction also comes in handy when it is being used on uneven ground. You can loosen the bolt, let it settle and then tighten them up again. 3. Rogue Adjustable Bench: fully adjustable back in with 4 positions from 0 to 90 degrees, with wheels and a handle for portability. 4. Rogue Westside Bench: Based on our patented Infinity Rigs. It combines the stability and safety of a 4×4 foot rack with our rock solid bench and adds the functionality of the Westside hole pattern with 1 inch hole spacing throughout. Includes pin/pipe safeties that can support over 1000 pounds. One of the most important parts of any apparatus used for supporting weight is the J-cup. All of our stands, racks and rigs with the exception of the ES-1 and the upcoming Monster Racks, use the same J-cups. The ES-1 uses a J-cup that is a similar design that fits on its 2×2″ uprights, and the Monster racks have a larger more substantial version. With any J-cup, there are three points that are crucial to safety and longevity. 1. It must be able to support the weight. Our J-cups will support over 1000 pounds, due to 5/8″ pins and heavy gauge steel construction. The pin goes all the way through the upright and then the whole J-cup swings into place with contact points on the front, sides and back. 2. It must be easy to get the weight into the J-cup. Our J-cups have a back that is 6″ high allowing you to properly rack the weight, by walking the weight into the upright, leaning into the upright and sliding the weight down into the support. We experimented with the depth of the J-cups over time and came up with a 4″ depth that allows the ability to get the weight in safely while not sticking out so far that they will get in your way during a lift. 3. It must be durable. With many other companies’ designs, the mechanism of changing the height of the J-cups can be the first place to fail. This happens when they use things like threaded pins or springs that will wear over time. Our J-cups have no moving parts to wear out. They will outlast your lifting career. In addition to the points above: Our J-cups are laser cut with round corners so there are no sharp points to catch your fingers and are lined with UHMW plastic to protect the knurling and finish of your bar. They are also powder coated for a long lasting durable finish. Finally, in order for the J-cups to be completely stable without set screws that can wear out, they are precision bent to our exacting specifications so that they fit perfectly on the uprights. If you want the ultimate solution for your gym that provides for all of your squat rack, and pullup needs, consider an Infinity rig or Wall Mount Unit. You can go as small as a 4 foot, wall mount unit that will allow 3 to 5 people to do pull-ups at the same time for the price of an iPad, or you can build a rig that is only limited by the size of your space. 1. Infinity Rigs are infinitely configurable with the ability to put pull up bars at different heights, with 2 upright height choices, and a group of attachments that keeps growing. A common configuration would place the infinity rig in the center of the gym with alternating 4 foot and 6-foot upright spacing for alternating squat racks and pull up space. You can have areas with higher, 12 foot, uprights that, allow more flexibility for ring heights and climbing ropes. Wall ball targets and other attachments like Safety Spotter Arms, flying pullup bars can be added so that everything you need for a workout is provided, leaving the rest of your floors, on either side clear for lifting, box jumps, double unders and other movements. 2. Wall Mount Units use your existing wall for half of the uprights saving you money and floor space. You can build a gym that is the opposite of the gym with the Infinity Rig, with racks and pullup bars lining the walls and the center of the gym clear. 3. Monkey Rigs ad monkey bars in addition to pullup and rack space, and can be used with Infinity Rig components as well as Infinity Rig add-ons. All of the Rigs use the Westside hole pattern, 1-inch spacing in the bench/clean pull area and 2-inch spacing everywhere else. All of the stands, racks and rigs use our new J-cups. I will give more details about them tomorrow. If you do not need portability and are looking for an even more stable option for squats, bench, press and pullups you can move up to a Power Rack. Since they are installed in the floor they are completely immovable. There is more room to put pull-up bars, so can add different types. There are also more options for spotting lifts. The racks come with pin/pipe safeties and you can add strap safeties or spotter arms. There is no substitute for the safety of lifting within the rack. Our racks also add band pins so that resistance bands can be incorporated into your squats, deadlifts and cleans. The R-3 has a footprint of 48×30 inches and is the Rogue version of the legendary Westside Rack. The R-4 is 48×48 inches and therefore adds more room to work within the rack for bench and squats. The R-6 adds enough storage for all of your bumpers to the rack for an all in one solution. All have the Westside hole pattern, 1 inch spacing in the bench/clean/pull area and 2 inches everywhere else. You can find several attachments for your racks including, but not limited to, different pull-up bars, wall ball targets, dip bars, landmines and plate storage. With so many choices out there, deciding which option to buy for your gym or garage can be a difficult one. This is the first in a series of articles about picking the right one for you. The first question you should ask is whether you need the stand or rack to be portable? There are many reasons why you might want portability. You may have limited space and need to reconfigure the gym for different workouts, you may be renting and not want to install anything, you may even want the ability to take the stand out to the park for workouts on nice days. If you need portability, for the most part that will mean a squat stand. Portability is one of the big advantages of squat stands, the other is the fact that stands are generally more affordable than racks or rigs. Traditionally there are 2 disadvantages to using a squat stand instead of a rack. 1. The stand is less stable and can move on you when racking the weight. 2. The stands do not have a spotting mechanism. However, the ES-1, S-1, S-2 and S-3 have minimized these problems. The bases are stable enough that there is no way that you are going to knock them over racking the weight, with the addition of our spotter arms, you can squat alone in safety. If you need maximum portability and the smallest possible storage footprint, our S-4 H base squat stands are the most stable independent squat stands on the market. When choosing from among these options here are some questions you might ask. 1. Do you need to do Pullups on the stand? If you are looking to do pull-ups on the squat stands, the S-2 and S-3 add this capability. If you have 8-foot ceilings, the S-2 is for you. If you have 9.5 foot or higher ceilings, you can take advantage of the S-3’s extra height. 2. Do you need the Westside hole pattern? All of these stands with the exception of the ES-1 have the Westside hole pattern. 1 inch spacing in the bench/clean/pull area and 2inch spacing everywhere else. The ES-1 has 2-inch spacing throughout. The Westside hole pattern allows for greater flexibility for your starting positions. 3. Do you need to be able to add attachments for things like spotter arms or dip bars? All of our stands other than the ES-1 and S-4 are compatible with the vast array of Infinity Rig add-ons. 4. Do you want to be able to use the stands as a yoke? If you want to add the functionality of a yoke while also using the stand for squats, look into the Y Series yokes, based on the same design as our S Series squat stands. Finally, if you do not need portability and would like additional stability for kipping pull-ups, you can add mounting feet and bolt the stand into the ground. The stands are available here. Choose three or more of any of the Buy 3 & They Ship Free items and those items will ship for FREE on your order. If you order additional items that are not from this section, you will only be charged to ship those items that are not from this page, you will NOT be charged to ship the “Buy 3 & They Ship Free” items. Look for the “Buy 3 & They Ship Free” logo on the items page or go to the Buy 3 & They Ship Free page. Only valid in the US 48 contiguous states. 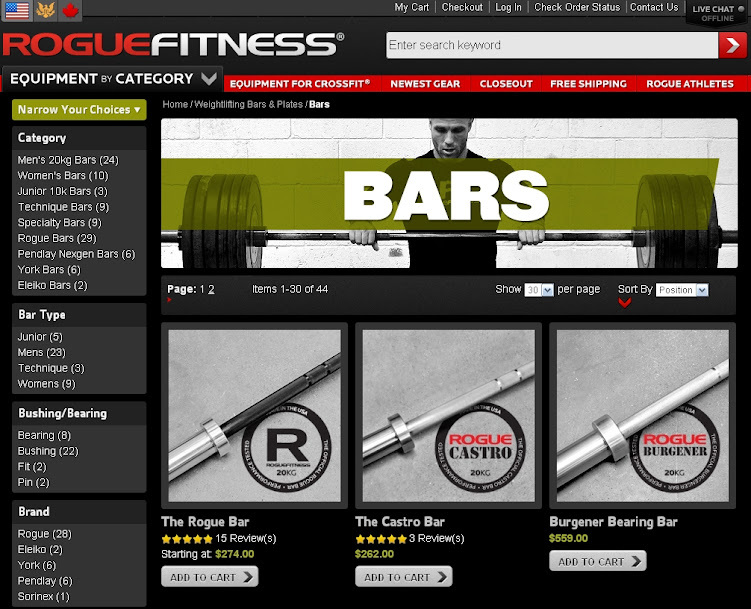 www.roguefitness.com is now the best place in the world to shop for a new bar. Not only can you be sure that any bar that you buy from our site will be top quality, it is now much easier to choose a bar to perfectly fit your needs. We have a huge selection of bars, ranging from needle bearing Olympic weightlifting bars, to men’s and women’s multipurpose bars. We also have bars ranging from powerlifting bars to junior and technique bars and even specialty bars, as well as everything in between with the tools and knowledge that will enable you to pick the bar that is perfect for your application. If you are looking for a certain brand, an intended use, a feature, a shaft diameter, a knurling texture, a construction method, a specific tensile strength, a coating, or even a certain color, it has never been easier to find what you are looking for. Whether you are looking for a men’s weightlifting bar, a women’s bar or need something more specific like a 28 MM bar with bushings and no center knurl or 29 MM bar made from 185K PSI steel with powerlifting knurl markings finding what you need is as easy as picking from the categories on the left side of the page. Keep choosing categories to narrow down the choices until you have found exactly the bar you are looking for. Check out our Bars Page to try it out.